Clown loach fish is quite popular aquarium fish because of their colored body and then they seems to be quite different in terms of shape.They have lively personality. Clown loach fish are active schooling fishes.They live happily in group of 5 or more else they may get stress. Clown loach are laterally compressed and have 3 black stripe on their orange body . Stripe may fade with the passing of time.These are sold when they are quite young at the size of 1.5 inches and are widely available in aquarium shops.But remember they can grow about 6-10 inches even in captivity.So if you are having a small or medium aquarium then you should drop the idea of getting them because they are active swimmers and requires lot of swimming space. They make clicking noises when they are happy or stressed.If care is taken properly they can have healthy lifespan of about 10 years.These fishes require high standard of water condition as they are extremely sensitive to pollutants and other nitrates.So do take care of water standards .These are peaceful fishes .Small fishes like platy, guppy can live happily with them and can breed easily in presence of clown loach fish .The tank should not have very intense lightning and have soft substrate.The aquarium should have lots of hiding places made of woods ,rocks and plants.Provide live plants in tank if possible.Plants should be strongly hold at the bottom as they can dig and uproot them.Water change is needed so do it every week .Change 25% of water weekly. Note: These fishes have bifurcated subocular spines, which are used for defense or attack for others.They may use it if caught in net and may harm owner or itself.So use very large bad or solid container while being moved. 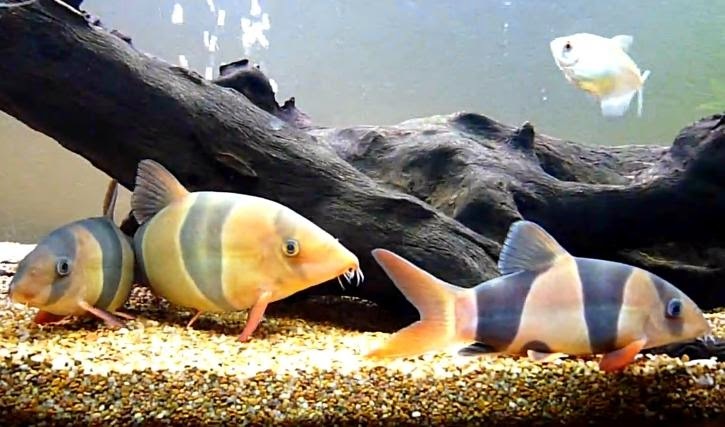 Sometimes clown loach swim on their side or upside down, or appear ill.They may even lie on their side on the bottom of the tank and appear dead.This is normal behaviour show by clown loach .So aquarist should not remove them until he is confirmed. Feeding : Omnivorous, can be fed on both live as well as frozen foods. It is quite tough job to distinguish between male and female clown loach fish. However you can predict whether it is male or female by looking at their tail. The mail's tail is generally larger and hooks inwards rather then pointing straight out from the body. While the females are more smaller and slender. The tail appear like a claw in case of males while female's tail is not like this. I guess this information is useful for you for differentiating between male and female clown loach fish. Clown loach fish breeding is quite complicated task.They are egg layers. 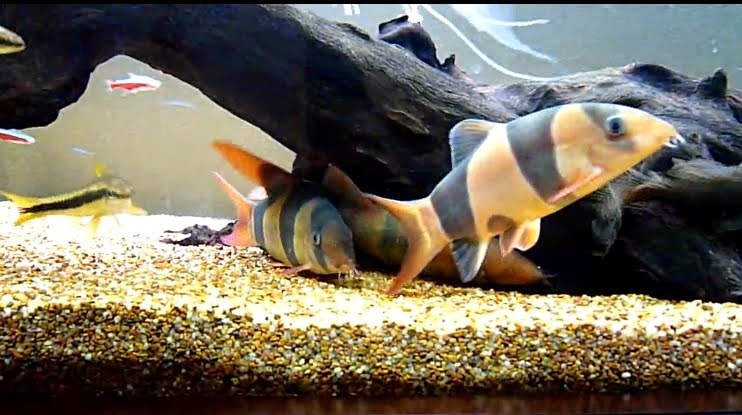 Breeding clown loach in aquarium is very rare and difficult. You need lot of luck and hard work to carry out their breeding .They must be sexually mature to carry out breeding generally they become mature at the size of 7 inches or more. You should have large aquarium minimum of 50 gallons with good water quality. Set the temperature to 85 Fahrenheit or 29 Celsius. Ammonia and nitrite should be around 0. Nitrate level should be less then 20 and pH should be 6.5. You should have lots of live plants in aquarium. 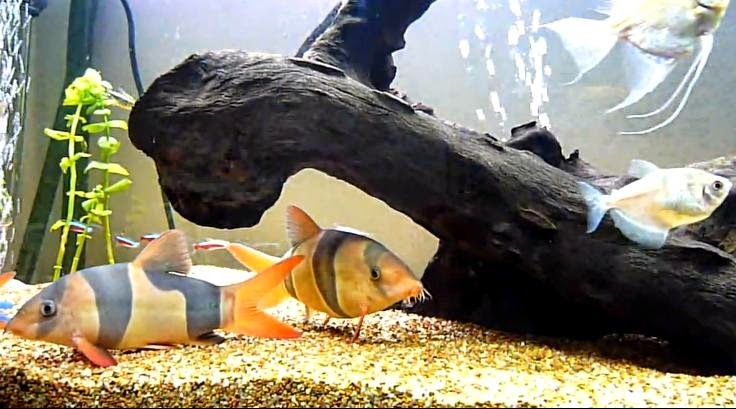 Clown loach starts eating live fishes as their food few weeks before spawning.The size of girth of females increases before spawning and it increases very rapidly. Then the female may spread the eggs in aquarium. They may eat their eggs so remove parents to another tank. Give liquid fry food to babies for first few weeks. After 2-3 weeks give them crushed flake food. Take care of fry. Give them food 5-6 times a day. Don't overfeed clown loaches it may be harmful for them. Keep changing some amount of water in 3-4 days.